Spend your day in Icy Strait skimming over the cool, blue waters of the North Pacific. 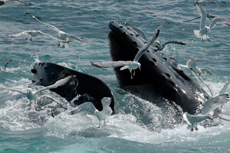 See magnificent humpback whales as they emerge to the surface from the comfort of a boat. 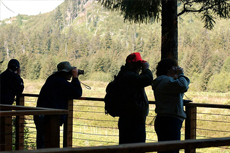 Venture into the pristine wilds of Icy Strait to see some of Alaska’s most popular and iconic wildlife, such as grizzly bears, bald eagles and black-tailed deer. 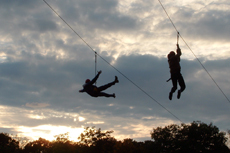 Get a panoramic view of Icy Strait and the surrounding wilderness on a ziplining adventure nearly 5,300 feet above land. Take a scenic drive along the northern Inside Passage and through Hoonah -- Alaska's largest Huna Tlingit village amid a stretch of incredible scenery and wildlife. Looking for an active way to experience Alaska’s breathtaking scenery? Kayak through Icy Strait’s icy blue waters. 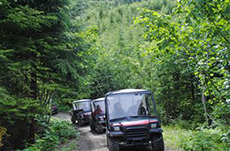 Explore the rugged back country of Icy Strait as you learn about its history, all while manning a 4x4 ATV. 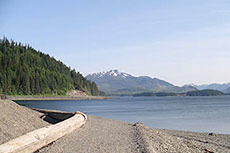 Hop into some waterproof clothing and take sail into Icy Strait's salty water for a day of fishing. 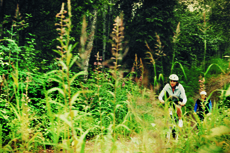 Explore the wildlife in the woods of Alaska with a nature bicycle tour around Icy Strait. Icy Strait provides a pleasant experience for cruise passengers who want to explore the Alaskan hinterland a bit, browse a few decent shops and have a light lunch. 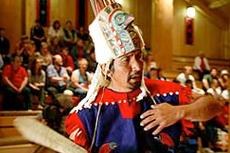 If folklore is your thing, spend an hour at the Native Heritage Center Theater, watching traditionally costumed members of the Huna Tlingit Dancers troupe enact their tribal heritage through song, dance and storytelling. Even if you don't want to see this, take a stroll over to the center anyway; its elaborately carved totem poles are well worth a closer look. So, too, is the free-to-enter Cannery Museum, which is crammed with various historic bits of fish-processing paraphernalia. The best way to make sense of the machines is to take a Historical Cannery Tour, on which you'll be given a souvenir timecard before donning a fish-cutter apron and starting a factory worker's "shift" -- which will teach you every stage of the canning process, including can-testing and filling. More interesting were the "fascinating Alaska facts" cunningly concealed behind wall-mounted, "Alice in Wonderland"-style wooden doors. Did you know Alaska's longest day starts on May 10 and lasts three months, while its longest night starts on November 18 and lasts two months? I discovered, too, that Alaska boasts 52 percent of the world's earthquakes, 100,000 glaciers and 29 volcanoes. Astounding as it is to visit, I wouldn't be keen to live there all year. The 2.5-hour Remote Bush Exploration and Wildlife Search, led by a native guide, gives you far more of an insight into the wit, wisdom and forest lore of the Tlingits than any number of heritage floor shows. Our tour was escorted by Dennis, a cheerful half-Irish member of the Tlingit Eagle Clan, who makes his living from fishing and logging -- unless a cruise ship is in town. As our school trip-style bus rattled its way past Frederick's Bay, he pointed out whales and harbor seals and told us sea otters and bald eagles are also at home there, as are four types of Alaska salmon, which -- together with crab, halibut and black cod -- formed the mainstay of the Tlingit community's fishing industry when the Hoonah Trading Company cannery was founded in 1893. He had some entertaining tales to tell of Hoonah characters and history. And, when we left behind the clapboard houses of Hoonah's main street and reached the rain forest for the start of our nature walk, his knowledge of the woods and wildlife proved even more fascinating. He gave us a taste of huckleberries, salmonberries and thimbleberries; showed us the differences between deer and bear trails; and explained how plants like the devil's club and the skunk cabbage are used in Tlingit medicine and cookery. Best of all, he showed us deer feasting on kelp at the borders of a tidal river, and as we headed back toward Hoonah, we spotted a brown bear lumbering through the skyscraper-tall pines of Christmas Tree Pass. For a fabulous, back-to-nature experience, it was hard to beat. Flightseeing over Glacier Bay: This tour lasts nearly two hours. Hourlong flights depart from Hoonah Airport and take passengers across the whale-dense waters of Icy Strait to see the spectacular ice fields, forests, lakes and waterfalls of Glacier Bay National Park and Preserve. 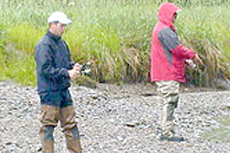 Saltwater Salmon Fishing: This is a three-hour excursion to fish the densely populated stretches of Icy Strait. 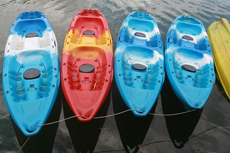 Warm, waterproof clothing and deck or rubber-soled shoes are essential, and the minimum age is 10. 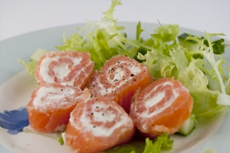 Caught fish cannot be stored on your cruise ship but can be locally processed and shipped to your home at extra cost, negotiable and payable onsite. Whale and Marine Mammals Cruise: This two-hour tour aboard a sightseeing vessel takes passengers 17 miles out through Icy Strait to the Point Adolphus area, a prime feeding ground for humpback and orca whales. An onboard naturalist will offer commentary on the habitat and behaviors of whales and other local wildlife, including stellar sea lions, bald eagles and harbor seals. Wear warm, waterproof clothing and sturdy nonslip shoes for the open-air observation deck.